Next year is a turning point, with the expected updating of the EU Bioeconomy Strategy and Action Plan giving an opportunity to set a new level of ambition and focus on how the circular bioeconomy can create a sustainable, renewable society. Speakers were agreed that the bioeconomy is inevitable. How the circular bioeconomy can move from aspiration to realisation is the next priority. John Bell, Director for Bioeconomy at DG Research and Innovation said there would be a mainstreaming of the development of the bioeconomy over the next year, and its embedding in other policies. “Bioeconomy can reach parts of society and economy that other policies can’t reach”, he said. The afternoon session focused on the role which forests play in a European circular bioeconomy. Georg Winkel, Head of EFI’s Resilience Programme presented key conclusions from a forthcoming What Science Can Tell Us study on the European forest bioeconomy. 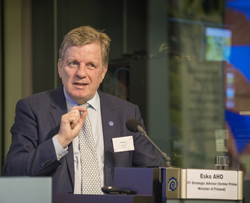 People are at the heart of a forest-based bioeconomy, he emphasised, with a growing group of urbanised forest owners providing a big opportunity to align consumer demands with producer interests. Sustainability is a key factor in engaging the population in the wider bioeconomy narrative. 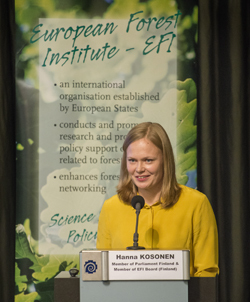 The ThinkForest seminar, Looking ahead to a circular European bioeconomy’ was held at the International Press Centre in Brussels on 7 November. The presentations from the event are available. From Science to Policy 5: Leading the way to a European circular bioeconomy strategy was published by the European Forest Institute on 31 October. Download the full study or the executive summary.